Despite many studies looking at which bread is the healthiest, it is still not clear what effect bread and differences among bread types have on clinically relevant parameters and on the microbiome. In the journal Cell Metabolism on June 6, Weizmann Institute researchers report the results of a comprehensive, randomized trial in 20 healthy subjects comparing differences in how processed white bread and artisanal whole wheat sourdough affect the body. Surprisingly, the investigators found the bread itself didn't greatly affect the participants and that different people reacted differently to the bread. The research team then devised an algorithm to help predict how individuals may respond to the bread in their diets. All of the participants in the study normally consumed about 10% of their calories from bread. Half were assigned to consume an increased amount of processed, packaged white bread for a week—around 25% of their calories—and half to consume an increased amount of whole wheat sourdough, which was baked especially for the study and delivered fresh to the participants. After a 2-week period without bread, the diets for the two groups were reversed. Before the study and throughout the time it was ongoing, many health effects were monitored. These included wakeup glucose levels; levels of the essential minerals calcium, iron, and magnesium; fat and cholesterol levels; kidney and liver enzymes; and several markers for inflammation and tissue damage. The investigators also measured the makeup of the participants' microbiomes before, during, and after the study. 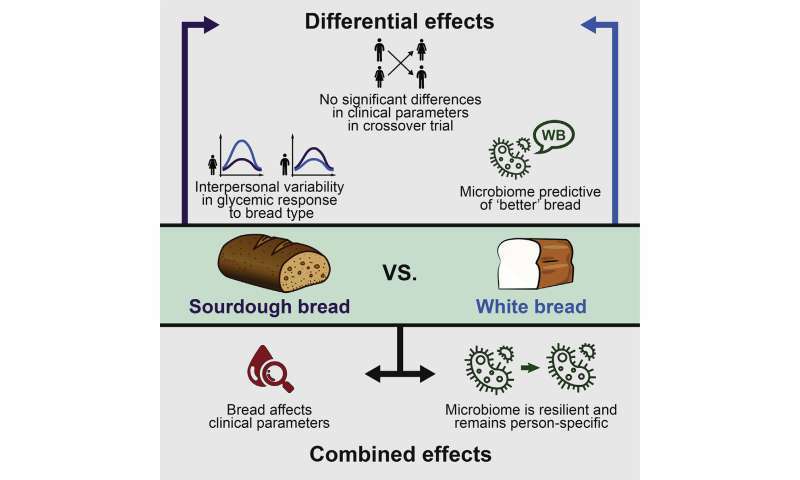 "The initial finding, and this was very much contrary to our expectation, was that there were no clinically significant differences between the effects of these two types of bread on any of the parameters that we measured," says Eran Segal, a computational biologist at the Weizmann Institute of Science and one of the study's senior authors. "We looked at a number of markers, and there was no measurable difference in the effect that this type of dietary intervention had." Based on some of their earlier work, however, which found that different people have different glycemic responses to the same diet, the investigators suspected that something more complicated may be going on: perhaps the glycemic response of some of the people in the study was better to one type of bread, and some better to the other type. A closer look indicated that this was indeed the case. About half the people had a better response to the processed, white flour bread, and the other half had a better response to the whole wheat sourdough. The lack of differences were only seen when all findings were averaged together. "The findings for this study are not only fascinating but potentially very important, because they point toward a new paradigm: different people react differently, even to the same foods," says Eran Elinav (@EranElinav), a researcher in the Department of Immunology at the Weizmann Institute and another of the study's senior authors. "To date, the nutritional values assigned to food have been based on minimal science, and one-size-fits-all diets have failed miserably." He adds: "These findings could lead to a more rational approach for telling people which foods are a better fit for them, based on their microbiomes." Avraham Levy, a professor in the Department of Plant and Environmental Sciences and another coauthor, adds a caveat to the study: "These experiments looked at everyone eating the same amounts of carbohydrates from both bread types, which means that they ate more whole wheat bread because it contains less available carbohydrates. Moreover, we know that because of its high fiber content, people generally eat less whole wheat bread. We didn't take into consideration how much you would eat based on how full you felt. So the story must go on." Oh great they are trying to determine which type of poison is less poisonous. As far as you blood sugar levels go flour products are worse than table sugar. Microbiomes also react to herbicides, pesticides, and GMOs. Did the study take that into account? Why is there no mention of organics? MR166: Reference please. my understanding is that the amount of impact on blood sugar levels is less from complex carbohydrates due the the amount of time the body takes to break it down. 100 calories of sugar hits your body into glucose in a shorter timeframe then 100 calories of carbohydrates to glucose. HealingMindN. can you please post a reference (peer reviewed) to the impact of microbiome bacteria from GMO foods. I have never heard of that.